I do not enjoy cooking as much as i enjoy eating. But when you are ab adult you have to be able to cook to satisfy your cravings. I post my kitchen experiments often on FB but I do not share recipes mostly because I am nothing orginal to share. I have a recipe notebook given to me by my mom with all my favourite recipes of dishes she cooks for me. I have over the years added a few recipes of my choice. However,recently I realised there are some quick fix meals which are my original creations. These are simple dishes which can be prepared for one person as a breakfast dish or snack or lunch. The 1st recipe I am sharing is a 10 min fried rice. 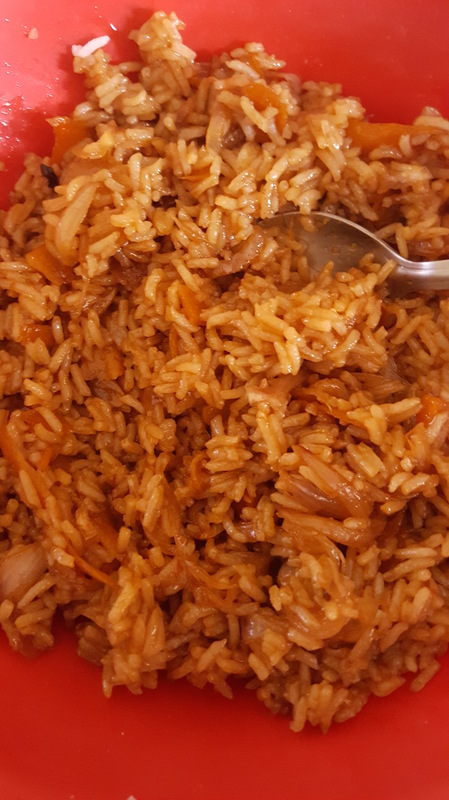 It’s really very simple to prepare mainly for your leftover extra rice as a special lunch treat for yourself. Heat oil in a wok. Add the onion and suate till translucent. Keep it on medium flame. Add the carrot and temper with a sprinkle of salt. Mix and cover for 2 minute to let the vegetables soften. Add the boiled rice mix it with vegetables. Cook for 3 minutes. Add 1 tbsp each of soya sauce and tomato sauce , 1 tsp of chilli sauce. Mix well to coat all the rice. Fry the rice well if required turn up the heat. Sprinkle little water to keep it from sticking to the bottom. Cook for 2 minutes. Once done. Add some pepper powder and adjust salt. And your spicey fried rice is ready to enjoy.